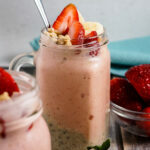 Smoothie parfaits are light and fresh, with layers of strawberry, peach, and banana smoothie, chia pudding, granola, and topped with fresh fruit. It’s basically every healthy breakfast you could crave rolled up into one pretty package with only a few minutes prep. Every year there is one thing that I add to my New Year’s resolution list, eat a healthy breakfast! This simple task is just something that doesn’t come naturally to me. It’s not hardwired into my DNA. Left on my own, I’m more of a drink two cups of coffee and get on with my day kind of a person. The older I get though, the more I can tell that my body does not appreciate this. I just don’t feel great when I don’t get a good breakfast. 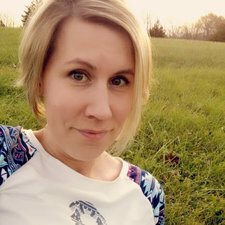 And really it’s kind of hypocritical of me, because I am constantly telling my college aged daughter, and the other kids, but mostly nagging her to eat a healthy breakfast! This year my daughter got a blender for Christmas and it’s been a game changer for us when it comes to preparing easy, healthy breakfasts we will actually eat. For years and years, I’d thought of blenders as kind of a superfluous appliance, because I never used one growing up. My mom didn’t have one. Now I’m wondering how we’ve gotten by for so long without one. It’s so incredibly easy to grab some frozen fruit, yogurt and milk, and just a few seconds later have a breakfast that will completely fill us up with absolutely zero guilt and hardly any cleanup required. 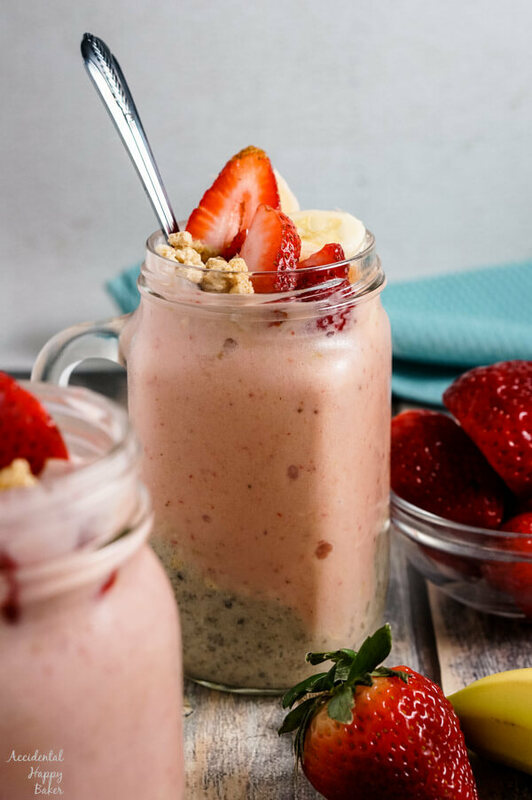 For today’s recipe, we’ve actually taken 2 of our favorite breakfast options, chia pudding with fresh fruit and a fruit smoothie and combined them together for the ultimate breakfast, a smoothie parfait. This recipe is a great way to eat chia if you don’t care for the tapioca like texture commonly associated with chia. My boys won’t touch chia, but they love these smoothie parfaits. 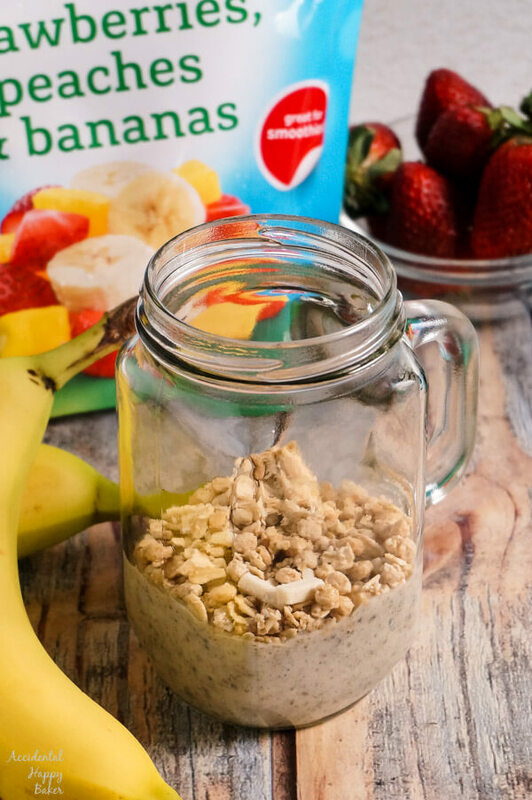 This smoothie parfait recipe takes just a few minutes to whip up. The bottom layer is a blended banana chia pudding. 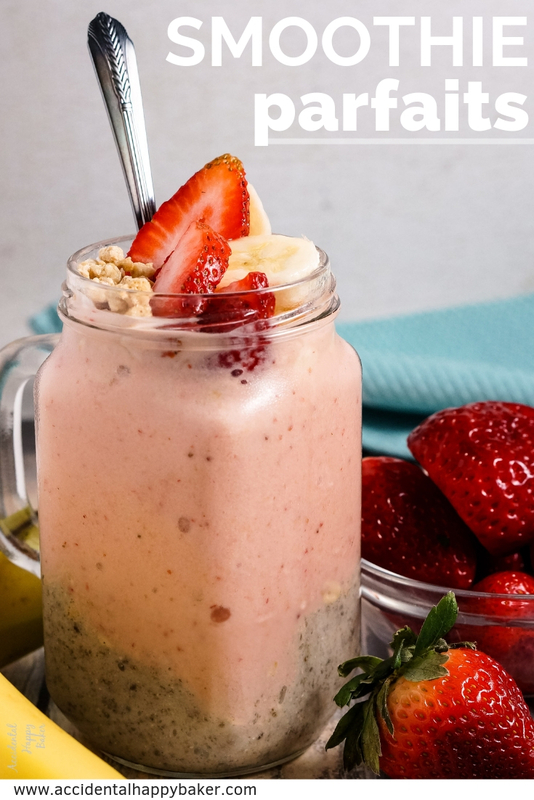 Chia seeds are full of fiber and omega 3 fatty acids, making them a great addition to a smoothie.. Then you’ll find a layer of granola.The next layer is fruit smoothie made from our favorite frozen fruit blend, Dole strawberries, peaches, and bananas. This blend not only tastes great, but it makes a really pretty smoothie. And then the parfait is topped off with more granola and fresh fruit. 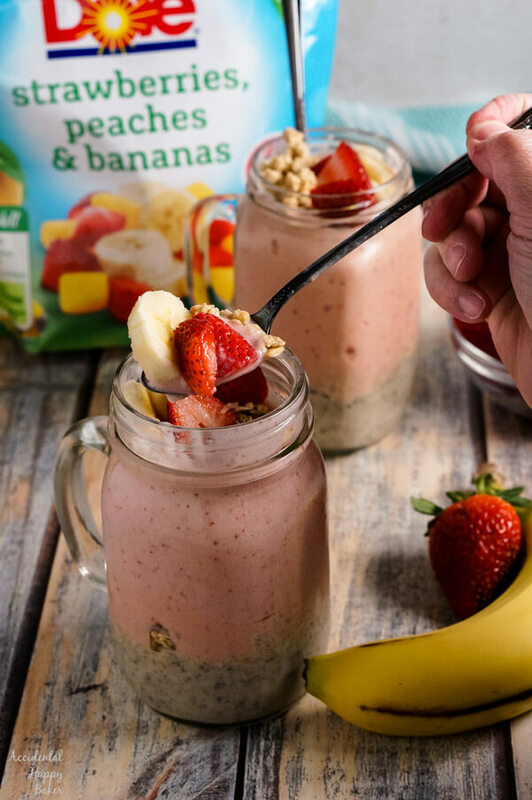 Pretty meets pretty easy when it comes to a smoothie parfait. This recipe makes enough for 2 servings, perfect for sharing with your spouse, your favorite workout buddy or your kid that you’ve been nagging to eat breakfast. Layers of strawberry, peach, and banana smoothie, chia pudding, granola, and topped with fresh fruit. Add the banana, chia seeds, yogurt and ice to a blender and blend until smooth. Pour into the bottom of 2 bowls or mason jars. Sprinkle with half the granola. 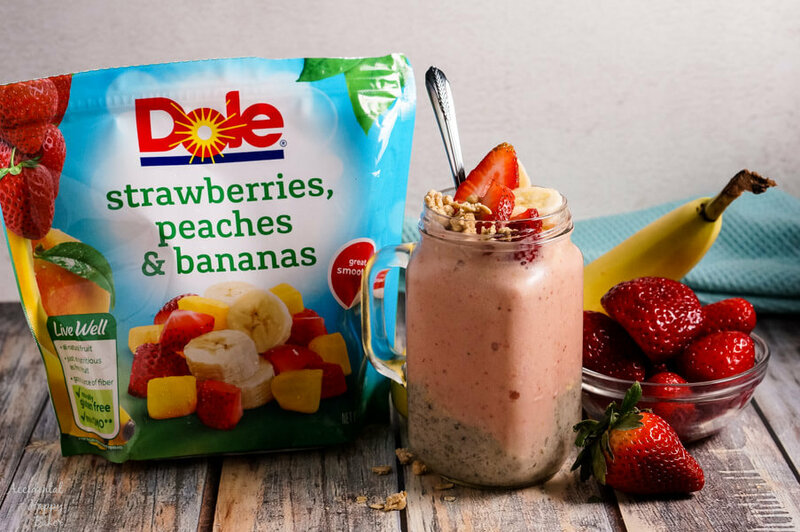 Add the Dole Strawberry, Peach, and Banana blend to the blender along with ⅓ cup yogurt and milk. Blend until smooth. Divide the smoothie mixture between the 2 containers. Top with the remaining granola and fresh fruit. What a tasty breakfast idea! We always have frozen fruit to make smoothies almost daily. 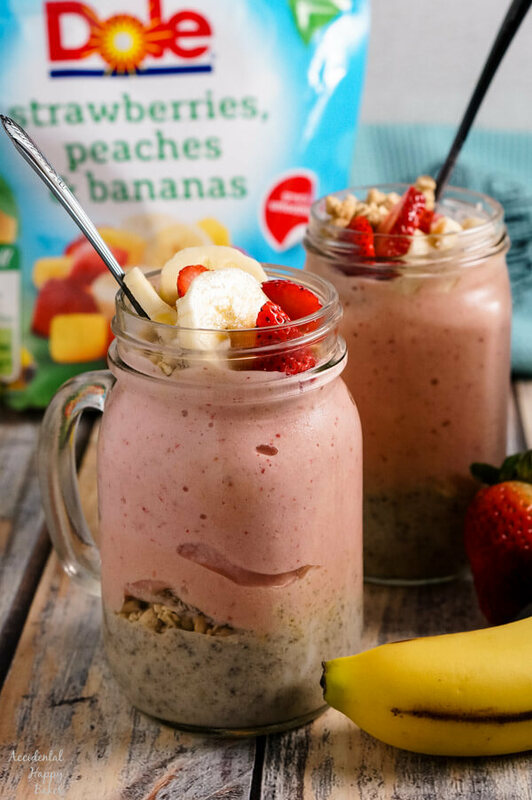 Love the combo of strawberry, peach, and bananas. I need to try out this recipe asap. It is my favorite combination for smoothies! Hope you’ll enjoy it Marie. Like you I used to start my day with just coffee but now I also have a ‘normal’ veggie/fruit smoothie but these smoothie parfaits look so much more interesting! Looking forward to trying these out! What a great idea to do parfaits with smoothies. Definitely going to give that a try!